“Shad fishing is a great way to both fill your plate with a great delicacy and have a lot of fun on light tackle. 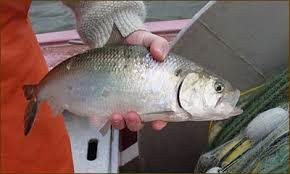 As the herring start moving up the Merrimack River and the water temperature rises to about 50 degrees, the shad will start their spawning run. This usually starts in late April, peaking in mid-May and dwindling out in mid-June. Another correlation is the flowering of the Forsythia and Serviceberry (nicknamed the shadbush for obvious reasons) bushes. When they start to bloom the fish are in!